The Wolves in the Walls is a short illustrated horror story for young children. This might seem inappropriate at first glance in these times when children's fiction is so often bland or sugary. But in fact this book has a strong sense of fun along with the suspense, and of course children enjoy some real dramatic tension. Dave McKean's illustrations are full of depth, texture, and rich beautiful colors. Lucy is a young girl living a typical suburban life, but she hears noises coming from behind the walls, and she is convinced that there are wolves there. Her jam-making mother and tuba-playing father reassure her that she is mistaken, and her little brother says she is bats. 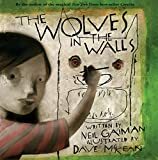 Lucy takes comfort in talking with her pig-puppet, but that doesn't stop the wolves from coming out of the walls, and then the family flees from their house. She realizes that she left her pig-puppet in the house after the wolves have taken it over, so she creeps back in to get her. This gives Lucy an idea about how she and her family would be able to get back into their house. Neil Gaiman's story evokes some of the fears of childhood powerfully, taking them seriously and reassures the reader that Lucy has the courage and resourcefulness to cope with the dangers she may face. Best of all, McKean's images are wonderful, mixing different media -- photography, pen and ink, computer manipulated images, and painting -- and combining a dark realism with a strong sense of whimsy. Excellent stuff!